It's sad to say, but I will no longer be writing up anymore Scrabble Challenges. Frankly, I just don't have the time to make them now. And though they are incredibly fun and "challenging" to conjure up, I'm not sure that people are finding them as useful as I had hoped. But really, it all comes down to time. So, unless I have a future craving for puzzle-making, last week's Scrabble Challenge #20 was the last one. Here's the answer to Scrabble Challenge #20: What Would You Do with a Rack Full of Vowels? Q: Using the game board below and your rack of A, U, E, E, O, I, I, find out the best play. Would it be exchanging letters and passing your turn, or is there a vowel-heavy word that you can place on the board? A: Sure, you could exchange a few letters, but why would you want to do that when you can play a move on the board—effectively "exchanging" letters—and score some points. Sure beats zero points and a skipped turn. 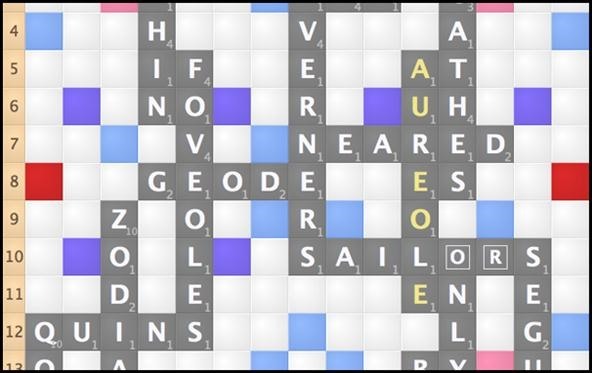 So, with that in mind, the best possible play would be AU(R)EO(L)E, which takes advantage of two Double Word Score squares. 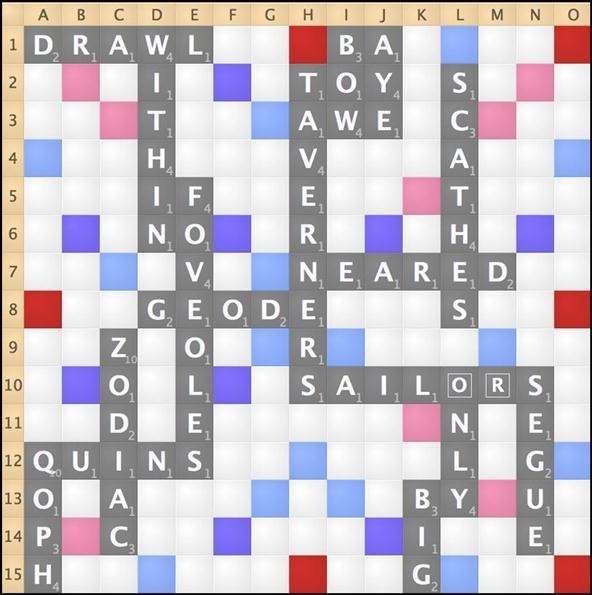 You spelled five words, "exchanged" five letters, and scored an amazing 43 points! Though that is the best play, there are also a couple other moves you could play on the board. There are a few other words you could play that let's you "exchange" at least three letters on the board for some points, but only if you're playing outside of North America using CSW12; IU(R)E for 19; (R)OU(L)E for 16; (R)AI(L)E for 16. And you could get a decent amount of points using IO to spell IO, (P)I(C), and (H)O for 23.